4th Avenue Jones is a band that has consistently pushed the boundaries of its sound with a groundbreaking blend of rock, soul, and Hip Hop influences. Their energy is reminiscent of the glory days when music was art and innovation was King. The 4th Avenue Jones signature sound, 'Hiprocksoul', is a flavor that defies conventional songwriting with a combination of energy and precision. They recently completed work on an incredible new album entitled STEREO: The Evolution Of Hiprocksoul (Lookalive/Gotee/EMI). Lead vocalist Ahmad Jones calls the project "an optimistic celebration of music, and its ability to help quench our despair." 4th Avenue Jones was conceived by Ahmad Jones, known to long time Hip Hop fans as Ahmad. His 1994 platinum single "Back In The Day" thrust him into the national spotlight at the age of 18. Frustrated by the corporate politics choking the industry and the "plastic junk" being forced on the masses, Ahmad decided to abandon his solo career and form his own label, Lookalive Records. He set out to bring together a dream team of gifted musicians who were committed to the art of music. "It was my goal to create a situation that enabled us to make the music we loved on our terms, and be treated fairly in the process," he explains. "In the band we feed off one another's influences and are always introducing each other to artists we dig, like Tribe Called Quest, Depeche Mode, Public Enemy, The Cure, Rachmaninoff, Sibelius, Stevie Wonder, Prince, Rage Against the Machine, Radiohead, and almost every artist that ever appeared on YO! MTV Raps. We work things out in a collaborative way - it's a lot more fun than being a solo artist." The vision for the band was conceived in 1997 when Ahmad Jones commenced rehearsals at a house, which was located on 4th Avenue and Jefferson in South Central Los Angeles. 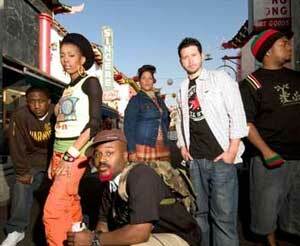 In 2000 the band was formed, and the Jones' independently pressed and distributed their first full album, No Plan B. Their persistence paid off as their fan base in the Los Angeles area began to grow. Local weekly gigs soon followed, spreading word of the Jones' classic level of showmanship like wildfire throughout the West Coast music scene. Frustrated, the Jones' eventually earned their release from the label altogether. "Our initial response to the Interscope fiasco was disappointment," says Ahmad. "But our disappointment led to such a tremendous musical freedom. We were encouraged to musically 'dumb down' a bit inside the corporate culture of the major label - and on a subconscious level we did. The lesson learned was to always be true to yourself and your art. Our true sound would have never been uncovered had we not been forced to dig a little deeper." Fortunately, by the time they returned to independent status the Jones' had already stamped an influential mark, and their fans stuck with them. Inspired with a new vision of things to come, some changes in the band were made. Ahmad enlisted a roster of amazing talent that would position the group for refinement and growth: his wife, Tena Jones, blessing the vocals, Tim Stewart aka "Timmy Shakes" joining on lead guitar, the amazing Gailybird on violin, "Phat" Albert Parker on bass, and Derrick "Dee" Calloway on drums. The new collaboration ensured consistent, invigorating performances, and set the pace for the next phase of their careers together. "Our chemistry shows that we are authentic about who we are and what we do, and people appreciate that," says Tena. "People who support our band know we are always going to give it 100% in terms of our energy on stage, as well as our preparation beforehand." "The mixture of musical genres we cover while maintaining our own style gives us the ability to reach a wide array of people," Timmy Shakes says. "I think we just need to continue to make music that's from the heart, because people are hungry for that. What we are doing is different but it's still very relevant." Ultimately, it is 4th Avenue Jones' special blend of honest interaction and innovation that is the true key to their success. "I truly love and respect this group of people," says Phat Al. "Of course we understand that it might be easier to just make a replica of every song that is in frequent rotation, but I don't think we would be able look ourselves in the mirror. We've worked so hard to cultivate the 'Hiprocksoul' sound that it would be sort of anti-climactic for us to back down and take the easy way out. I'm more excited to be a part of something totally original and fresh, and I think people will appreciate a change in what is viewed as popular music." With their globally appealing sound and amazing live show, 4th Avenue Jones is creating a diverse and loyal following of supporters who don't mind 'keeping up'. "We will never stop wanting to improve," says Ahmad. "There is no place we will 'arrive' and feel satisfied musically. The journey itself is the best part of the process." Gailybird concurs: "At this point, I feel the strength of 4th Avenue Jones is resilience. We are not so set in our ways that we feel we have to control every step of our lives. Being able to overcome challenges, standing out when appropriate and pulling back when we need to. That's what has made us what we've become as a band."